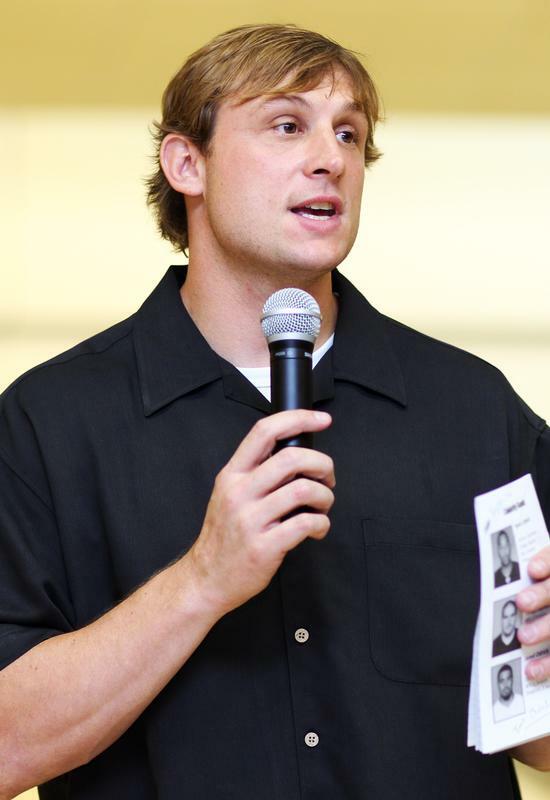 Chad Pennington played in the NFL for eleven years. 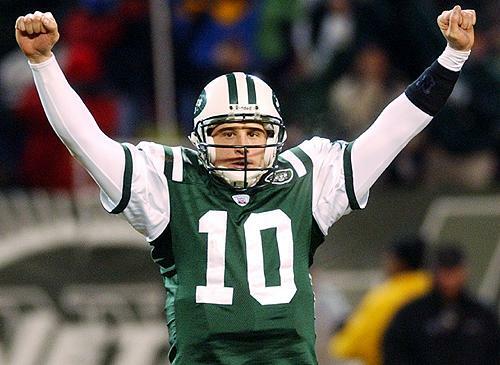 He was selected by the New York Jets in the first round in the 2000 NFL Draft. He played for the Jets then played for the Miami Dolphins. Chad won the NFL Comeback Player of the Year Award twice. He is the NFL’s all-time leader in career completion percentage. He is currently a color analyst for NFL telecasts on F OX. 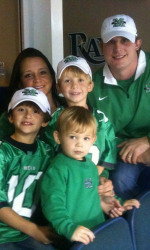 Besides having a great career in the NFL, Chad and his wife, Robin started up the 1st and 10 Foundation. That organization was created to build stronger communities by funding programs to help improve quality of life. They are also busy with their three sons, who love to play outdoors just like their dad. Chad and I were able to talk about his time in the NFL, fatherhood, winning the NFL Comeback Player of the Year Award, and his foundation. Art Eddy: Let’s first talk about your career in the NFL. You played for the Jets and the Dolphins. Both teams are in the AFC East. 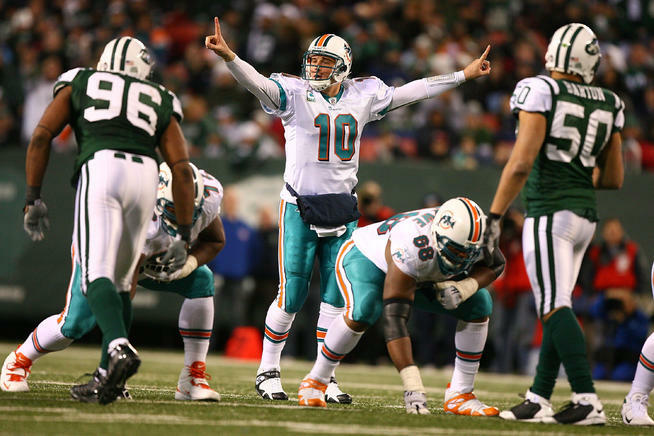 Do you feel that staying in that division helped your transition to the Dolphins? Chad Pennington: I certainly had familiarity with division and with the teams that we would be playing to try and win a division crown. I also had familiarity with Bill Parcells and Dan Henning and some of the other people that were in place in Miami when I made the transition from New York to Miami. AE: When would you say that you felt comfortable at your position after you were drafted? CP: I think my third year was when the light bulb really went on. As a rookie you are just surviving on your college instincts. Your second year you are trying to figure out how to be a professional. By your third year you truly start to make progress as a professional. You start to contribute to your team in a positive way. Even if you have some successful times in your first and second year, that third you I think that is when everybody starts to feel like okay I belong. This is where I am and what I need to do to have a long career. AE: You won the NFL Comeback Player of the Year award twice, becoming the only player since the awards inception to do so. What did winning that award twice personally mean to you? CP: First it meant that both organizations that I played for when I did win those awards meant that I had great support. I had a great support system when I was trying to rehab from an injury. I had great teammates that supported me. When I came back from the injury we were able to do some special things on the field. On a personal level it feels good that someone recognizes your hard work. It is very hard to come back from an injury. People don’t realize how much energy and time is spent just to get back on the field much less trying to play the way you are capable of playing. Playing after an injury is very, very difficult. It is a really exhausting process. To be able to win that award really meant a lot to me. AE: Name one change the NFL has made since you entered the league that you like and one that you wish that they never had changed? CP: I think that the game has gotten better from an entertainment standpoint. There are so many things that fans can get involved with the game and have real lifetime experiences with football. From a fan’s perspective it is really exciting. I think with the safety of the game at some point in time we have to realize that this is a gladiator sport. It is a dangerous game. You can’t take away all the dangerous risks. That is like saying that there are no car wrecks in NASCAR. It is just going to happen. I think the league is taking the appropriate steps to make it a safer game. We just have to be very careful that we are not taking away the integrity of the game as far as how this game is supposed to be played. As players we need to know that going in. We know what those risks are. To act like that we are not aware of concussions or that we are not aware of some of the things that go on is wrong as well. We got to make sure that we stay on that fine line and make it as safe as possible, but also realize that there is a risk in playing the game of football. AE: You have played in the playoffs in your career. How much is the stress level heightened come playoff time? CP: The excitement is certainly at a different level. The pace of game. The energy. The intensity of the two teams playing is at a different level. The winner goes on and the loser goes home. There is a finality to your season with that playoff game. It is the one time in the year that everyone is playing like there is no tomorrow. I think that is why fans gravitate towards the playoffs as well as the players. At the end of the day when you take away all the frills of the NFL, the entertainment value, and all those types of things as a player that is truly what you are playing for. It is to win the Lombardi Trophy and be called world champion. AE: Tell me a bit about your foundation and what type of events you guys do annually? CP: The 1st and 10 Foundation was started with my wife, Robin and me in 2003. Our ultimate goal was to improve the quality of life in the areas we contribute. Those areas would be East Tennessee, Southern West Virginia, and the Tri-State area. We were able to establish a grant program in 2006. Since that inception we have been able to grant more than 1 million dollars to those geographical areas because of our donors and supporters. The neat thing about our foundation is that all administrative calls are taken care of. Every donated dollar goes back into what we are trying to support. Our foundation is your foundation. That is what we always say. If you gave a dollar to the foundation we take a lot of pride to make sure that your hard earned dollar is put back to where it is supposed to be. We got a lot of different initiatives. We have holiday parties, ticket programs, and some different things. Now that we have moved to Lexington, Kentucky we are looking at some other initiatives and programs that we really want to dive into. It has been something that we really have enjoyed these past ten years. AE: What motivated you to start up the 1st and 10 Foundation? CP: The first thing was when Robin’s father battled leukemia for ten months. We saw a need for patient family services with leukemia and cancer patients. It was not only for patient, him or herself going through a terrible experience, but the family is in shock. The family is trying to deal with the disease and support their loved one without having much knowledge or information. So that patient family service part is very important. We felt like in the rural areas of East Tennessee and Southern West Virginia there are not big cities to access malls, movies, and other things to do. The community center is a source of life in these smaller areas and towns. We try to support community based programs and organizations to help many people as we can. The great thing about the community center is that affects all ages. That is what we were trying to do for the past decade. AE: As a father what are some of the values that you look to teach your children? CP: I learned from my dad. He always said the greatest gift you could give your children is yourself. Sometimes we get caught up in what we give our kids materialistically, but we try to focus on giving ourselves to our kids. We want to make sure they know how much we love them, how we care for them, and how important it is for us to provide the right path for them. Whether it be their integrity, their character, or how they go about doing their business and how they treat others. That is most important in our perspective. AE: Some players say that they won’t let their sons play in the NFL. What is your stance on that issue? CP: We certainly believe in all the positive things that surround the game of football and what it teaches our young men. There is mental toughness. There is physical toughness, teamwork, and accountability. You have to take ownership for your actions. We believe in those things that football provides. We also think that there is a special age whether it be fifth, sixth, seventh, or eighth grade where it is appropriate for a child to play tackle. Any time before that I think flag football is more appropriate for our youngsters. Number one they learn more. They learn hand eye coordination and they are aware of their surroundings. They don’t have to worry about contact. Secondly if they love the game, but are not ready for contact you don’t want to take the game away from them. We think that whenever they are ready they will know. There are so many positive things that come out of football. Are we worried about the injury risk? Yes. If you look at specialization of baseball and soccer and those types of sports there kids out there that have Tommy John surgery and tearing the ACL’s at 12 and 13 years old because they are playing too much. You got to make sure that you are giving your kids a break. You should teach them properly how to play the game. Give them a mental and physical break. They don’t need to play sports all year round. AE: Sometimes we see certain qualities in our kids that resemble ourselves when we were their age. What are some of those traits that you see in your kids? CP: My kids love athletics. They are very competitive. Being able to help them manage their competitive nature and not have them take it too seriously is always a challenge. They are very active. They love being outdoors. I love being outdoors. They love to learn. I was always curious. I wanted to learn new things. It seems like they want to do that as well. It is a lot of fun. Sometimes my wife and I will laugh about how three kids that come from the same parents can be so different. It is always a challenge, but it is always a lot of fun when we wake up in the Pennington household.